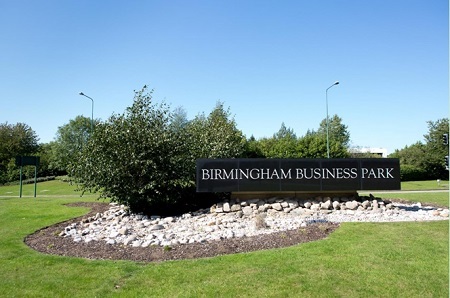 Birmingham Business Park is a 17-acre development located within easy reach of Birmingham International Airport and 12 miles east of the city centre. This site is owned by Canmoor Asset Management and Black Rock and is currently the place of employment of over 7,000 people. Office space at Birmingham Business Park features a mix of conventional and flexible space arrangements, and is split over 300 buildings, although this figure is likely to increase in the future, as additional office developments eventually come to completion. All in all, there are 2.4 million square feet with planning consent at the park, and nearly 400,000 of those have been earmarked for future commercial / mixed-use development. Offices at Birmingham Business Park benefit from 24-hour security and CCTV, and an on-site team management. Offices are fitted to Grade A standards and are equipped with superfast broadband, combined comfort cooling / heating systems, fully raised accessible floors, suspended ceilings, LG7 compliant lighting, and open floor plates. The park’s car parking ratio is 1:200 square feet. The park’s location and amenities have been designed to support a balanced lifestyle. The site is surrounded by 148 acres of parkland where tenants can enjoy outdoor activities for walkers and cyclists. Other ins-site amenities include coffee shops, a nursery, newsagents, fitness facilities, wellness programmes, Pilates and body conditioning classes, and weekly food carts and foodie trucks catering to all dietary requirements. Nearby amenities that may be of interest to prospective tenants include proximity to the airport, to several business hotels, and to the National Exhibition Centre. Frequent shuttles and mini vans are operated by Express Cars and depart from Waterside Centre. Birmingham International Air Rail Link station is only 2 miles away from the park. This station has excellent links with major UK cities: London is just over 1 hour away, and travel time to/from Manchester, Bristol and Leeds ranges between 1.45 and 3 hours. The park can also be reached by public transport from Coventry (11 miles away) via city bus X1. Bus X2 links the park with Birmingham and Solihull railway stations. High Speed 2 will have a station near the airport and will therefore improve connectivity between the park, London, Heathrow, and Manchester. Birmingham Business Park is conveniently located near the intersection of two major roads in the Midlands: the M6 and the M42. The park is a few minutes’ away from these two roads via junction 4 (M6) and junction 6 (M42). A car share scheme may be implemented in the near future. Also worth mentioning is the park’s close proximity to Birmingham airport, which is only 2.6 miles away. More than 100 companies are based at the park, and over 20 of those are UK or European headquarters in sectors like R&D, automotive, engineering, banking, professional services, digital media, communications, and utilities. Additional information on business park and office space opportunities in Birmingham.